Learn to make best Green Coriander Chutney Recipe – 3 Ways | Hare Dhaniye Ki Chutney | Hari Chatni Recipe with step-by-step Video tutorial. All these chutneys taste so flavourful and they all are unique. These dips can powerfully enhance the taste of any side dish. Plus, making them takes only a few minutes. No oil/ghee tempering is needed for these healthy and refreshing chutneys. These are very versatile so that you can use them as a dip for any snacks, sandwiches, or Indian stuffed parathas. Today’s recipe is a basic, effortless and a must accompaniment for any Indian kitchen. The recipe I am sharing today is a green chutney. If you have ever visited any Indian restaurant then you must have had green coriander chutney along with your starters. Green coriander chutney aka hare dhaniye ki chutney is a must for all types of Indian snacks and sandwiches. Be it any type of Chaat, Mathri, Potato Wedges, Sandwich, Toast, Patties, Kebab, Samosa, Mirchi Vada, Pakora, Kachori, Khaman Dhokla, Fried Rice, Bhel, Burger, Dosa , Idli, and the list goes on. 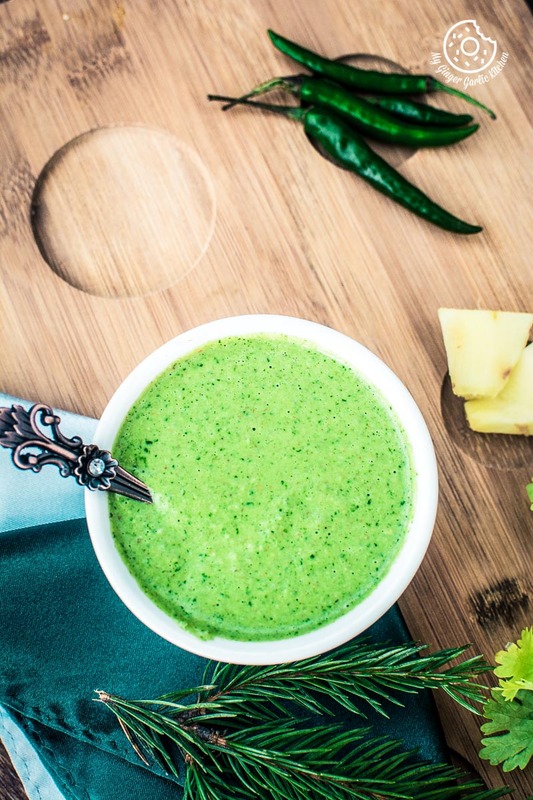 The great thing about this green chutney is that there are many ways of making it and serving it. I must say there will be at least 20-30 ways of preparing it, depending on the ingredients you have used. 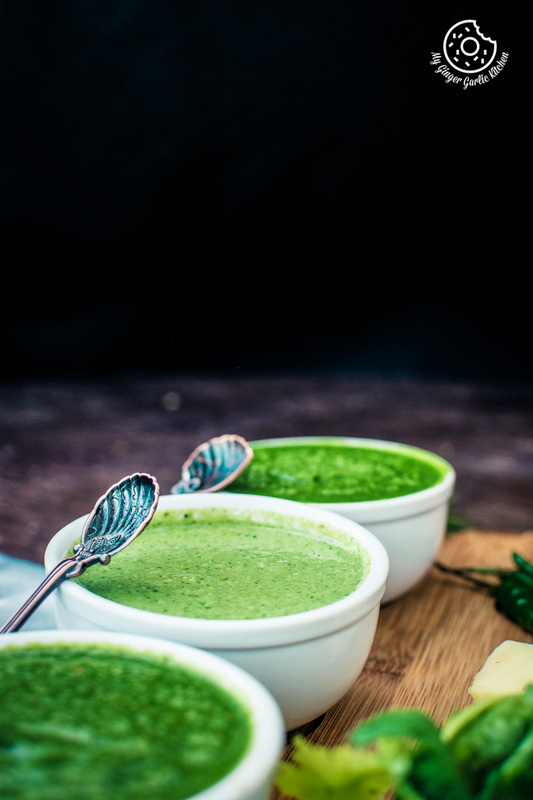 Today I am sharing 3 basic methods of making an easy yet flavorsome green chutney. 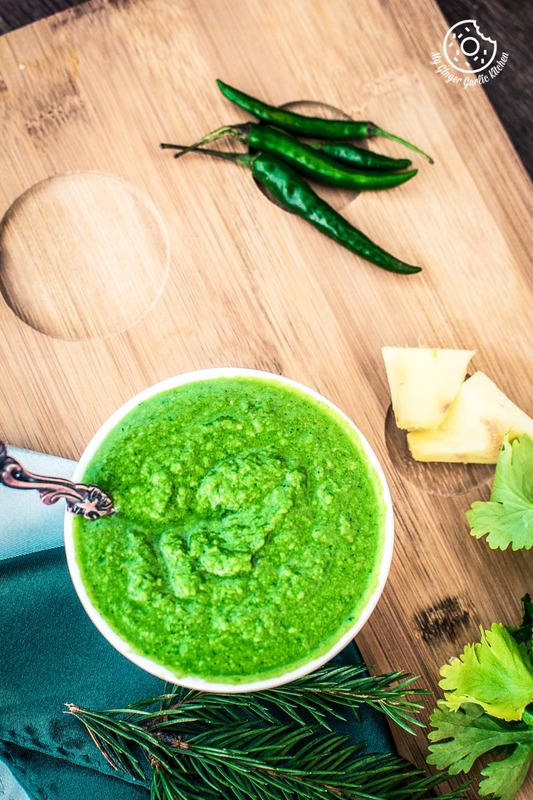 Coconut Coriander Chutney: Coconut and Coriander chutney is slightly spicy and tastes wonderfully coconutty and herby due to the combination of coconut and coriander. Peanut Coriander Chutney: Peanut Coconut Chutney has a nice and creamy texture and tastes spicy and tangy. A perfect delight for peanut lovers. 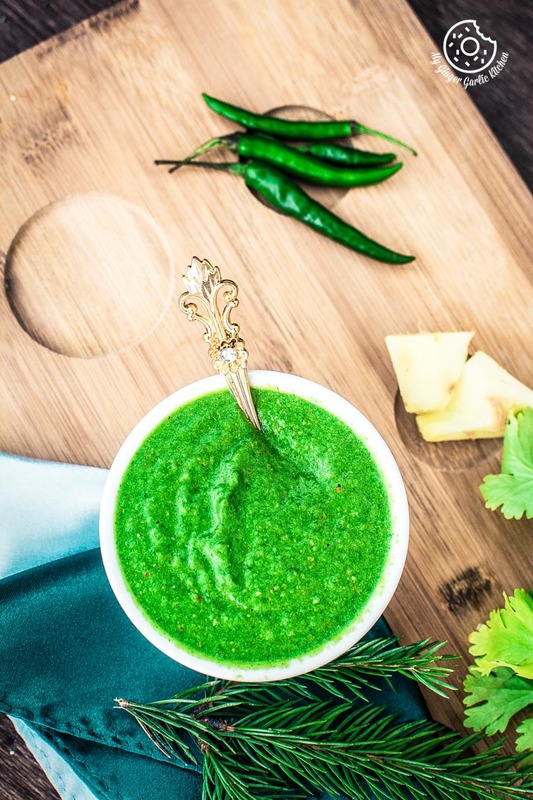 Tangy and Spicy Garlic Coriander Chutney: Coriander and Garlic Chutney is tangy and spicy and gives and nice garlic and coriander flavor. All these 3 chutneys taste so flavourful and they all are unique. They can powerfully enhance the taste of any side dish. Plus, making them takes only a few minutes. No oil/ghee tempering is needed for these healthy and refreshing chutneys. How to serve green coriander chutney? These 3 coriander chutneys are very versatile so that you can use them as a dip for any snacks, sandwiches, or Indian stuffed parathas. You can also make it as a sandwich spread. Basically, you can serve these coriander chutneys with any of your favorite bread, stuffed parathas (stuffed flatbreads), sandwiches, rice, biryani, snacks like pakora, samosa, kachori, chaat. You can also make ‘Dahi Chutney’ by adding some chutney to plain yogurt. Furthermore, you can even make a raita with them by combining ¾ cup natural yogurt, ¼ cup water, and 1 tbsp chutney and some salt and roasted cumin powder to taste. Sometimes, when I have some chapati dough, then I simply spread some green chutney on rolled paratha and roll it again, and then I roast it with some ghee/oil. This makes a lovely coriander paratha. Can I freeze green coriander chutney? Yes, you can definitely freeze green coriander chutney. If you want to preserve green chutney, freeze it in ice trays first, and once they are frozen, transfer frozen chutney cubes to Ziploc bags and freeze again. You can use frozen chutney for up to 2 months. Any time you want to enjoy green coriander chutney, simply thaw frozen chutney cubes overnight in the refrigerator and use. Let me tell you an alarming incident about these chutney photos which happened yesterday. Last week I had two recipes to share – Palak puri, and these 3 chutneys. I had the video raw files, so I edited the chutney video last week at the same time I edited the palak puri video. Then I decided to share palak puri first. And yesterday, when I was about to share this chutney post, I looked for the photos. But, I couldn’t find them anywhere. The first thing which came to my mind was, “have I deleted them all? No no no no, that’s not possible”. This thought of deleting photos itself crushed me. But the good thing is that I have a time machine backup of my laptop. So there was a ray of hope that my photos could be found and restored. Then I started searching for the photos in the backup but I couldn’t find any single photo of this recipe. I searched for a long time and still couldn’t find them. And then I speculated that I never transferred these photos from my camera card to my laptop, and thus they were not there. I supposed that they were only on my memory card earlier and when the card got full, I emptied my card without realizing that I deleted the original photos without transferring them first. And it made the situation really hopeless. Well, as predicted, the Lightroom library was empty. So we searched the photos into the hidden folders where Adobe hides the original RAW files converting them into Digital Negatives (DNG), and there were some DNG files from the past 60 days or so. Thankfully, I didn’t know that else I’d have found a way to delete them too. But at last, they were preserved. ( READ: Ignorance is bliss 😉 ) And the best part is that I usually edit and use only 2 photos while I make the video, but this time I took 6 photos to my Lightroom library. So amazingly, I got 6 photos, so the extra 4 felt like a happy bonus. 🙂 However, I had to edit them again because they were in DNG format. Nevertheless, I am elated that at least I could find some of the photos. Otherwise, I would have been waiting for another month to share these wonderful chutneys with you all. 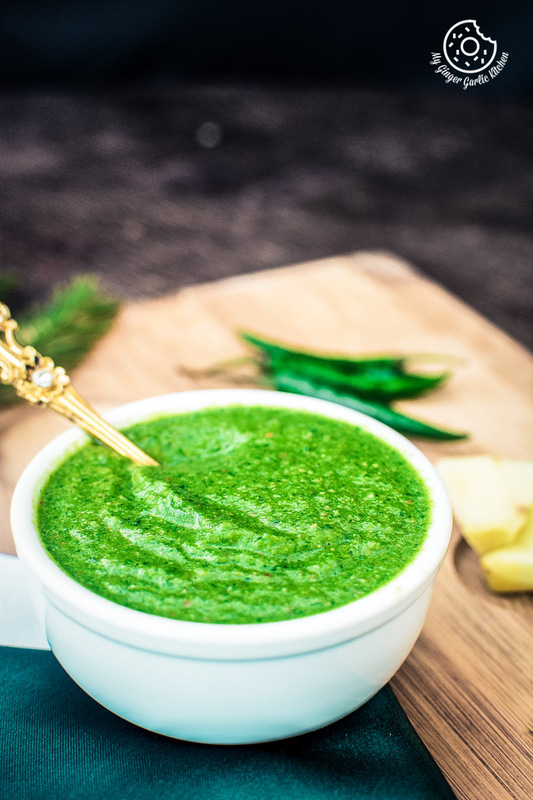 Well, now you know the interesting journey behind this recipe, I am sure you’ll all love these vibrant, guilt-free, aromatic, nutritious and delightfully lush green chutneys as much I love them. Try them once, and I promise that these swoon-worthy chutneys would make you drool. Do not add too much liquid while blending green coriander chutney. Otherwise, your chutney won’t turn into a paste. Also, it will lose water and turn watery if you will add too much liquid. Use a spatula and scrape off the sides of the jar once or twice for a better blending result. These chutneys are slightly spicy due to the addition of green chilies. But you can surely decrease or increase the amount of green chilies according to your taste buds. 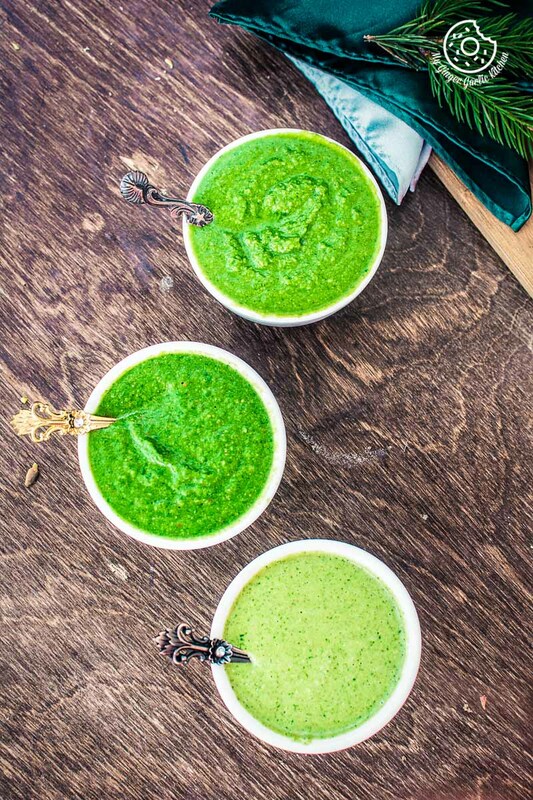 You can also add mint leaves to all of these 3 coriander chutney recipes. You can refrigerate all these coriander chutneys in airtight containers for up to a week. Let’s learn how to make Coriander Chutney Recipe – 3 Ways | Hare Dhaniye Ki Chutney | Hari Chatni by following these easy steps. All these 3 coriander chutneys taste so flavourful and they all are unique. They can powerfully enhance the taste of any side dish. Plus, making them takes only a few minutes. 1. Rinse well the cilantro/coriander leaves. 2. Add green chilies, ginger, garlic, cumin seeds, salt, desiccated coconut, lemon juice, coriander leaves and water to a blender. 3. Blend all the chutney ingredients to a smooth consistency. 4. Add more water if required. 5. Check the seasoning and add more lemon juice or water if required. 6. Transfer chutney to a bowl. 7. Serve this chutney with snacks. 2. Add green chilies, ginger, garlic, cumin seeds, salt, roasted peanuts, lemon juice, yogurt, coriander leaves and water to a blender. 2. Add green chilies, ginger, garlic, cumin seeds, chili flakes, salt, dried mango powder, black salt, lemon juice, coriander leaves and water to a blender.